Our article has recently been accepted for publication. If you use this database, please make sure to cite us! Thanks very much. Hout, M. C., Goldinger, S. D., & Brady, K. J. (2014). MM-MDS: A multidimensional scaling database with similarity ratings for 240 object categories from the Massive Memory picture database. PLoS ONE, 9: e112644. doi: 10.1371/journal.pone.0112644. On this page, you can download the full database, which includes a list of the stimulus categories and full summary statistics (e.g., number of participants, stress values, variance accounted for, and more), the stimuli themselves, the multidimensional scaling analyses (for real data and the Monte Carlo simulations), and the raw data matrices (for real data and the Monte Carlo simulations). Category Sorting Tables: Below, you can download two electronic tables that provide information on the full set of categories (for real and Monte Carlo data). Importantly, you’ll notice that there is a column for “Category Name” and one for “Filename”. The Category Name is just a shorthand, simple way of referring to the category of images. The Filename, however, is the base word by which the pictures were renamed. In the original Massive Memory Database, the filenames of the pictures were not named systematically. So we gave each picture a new name, such as “babycrib_1”, “babycrib_2”, and so on. Most of the time, the Category Name and Filename are the same. But in many instances, they are slight deviations from one another. For instance, “door knocker” and “doorknocker” for Category Name and Filename, respectively (the space was omitted from the filename base). From this table, you will be able to ascertain which picture files refer to which category. More importantly, you will see the full summary statistics (e.g., number of participants, stress values) which you can use to sort or filter the categories to meet your needs. Brady, T. F., Konkle, T., Alvarez, G. A. and Oliva, A. (2008). Visual long-term memory has a massive storage capacity for object details. Proceedings of the National Academy of Sciences, 105, 14325-14329. Konkle, T., Brady, T. F., Alvarez, G. A., & Oliva, A. (2010). Conceptual distinctiveness supports detailed visual long-term memory for real-world objects. Journal of Experimental Psychology: General, 139, 558-78. Here are the stimuli: Download HERE! Our full analyses: In the sheets below, you can download the full set of analyses performed on each of the 240 categories. Please see the published manusript for more details on how the data were analyzed. The first thing you’ll notice is that there are mutliple tabs for each of the stimulus sets, named via their index number (e.g., “Stim1”, “Stim2”, and so on). At the top of each sheet, you’ll see the Category Name, the Filename base word, the number of exemplars for that particular category, and the number of participants who contributed data. 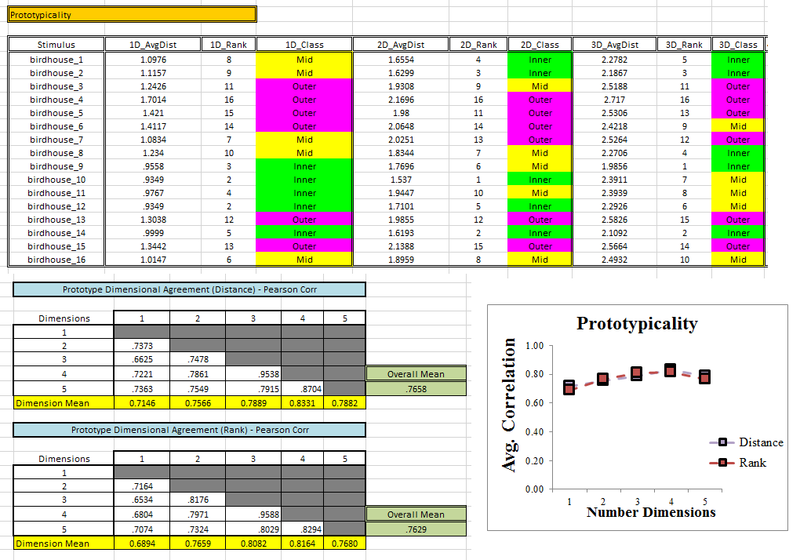 Below that, you’ll see Kruskal’s stress values for dimensions 1-5, as well as the proportion of variance accounted for. There are also plots provided that show each of those values as a function of dimensionality. Next, you’ll find the coordinates for each picture in multidimensional scaling space. The coordinates are provided, rounded to four decimal places, for each of the solutions (in dimensions 1 – 5). Below that, you’ll find the individual differences metric, weirdness scores. The weirdness values are reported for each data matrix (numbered in ascending order) across dimensionalities. Summary statistics are displayed in a small table to the right of the full data, and at the top of the sheet, these summary values are plotted. Next, you will find the prototypicality ratings. At each number of dimensions, you will find the average distance for an item (relative to every other item in the space), the ordinal ranking of the item (with 1 indicating the lowest average distance), and a classification as “inner”, “mid”, or “outer” based on a ternary split of the rank orderings. Summary statistics are displayed in a small matrix to the right of the weirdness scores, and at the top of the sheet, these summary values are plotted. 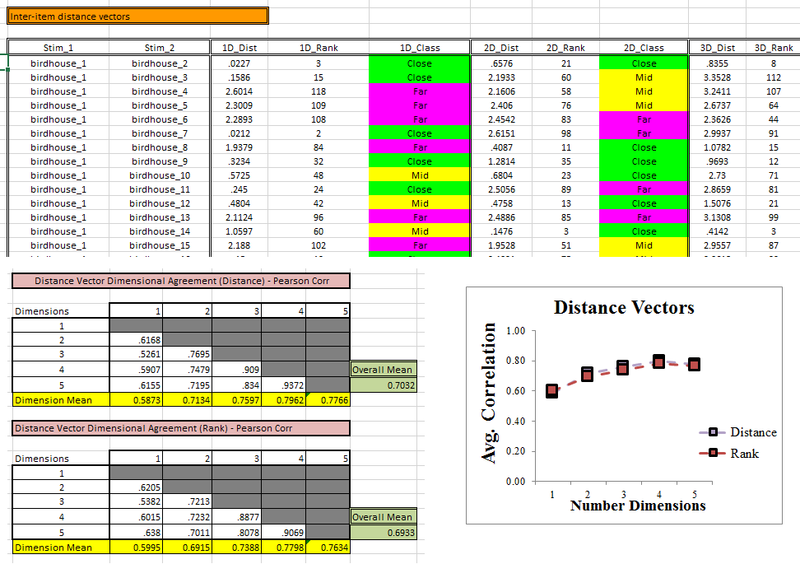 Lastly, you will find the inter-item distance vector values. At each number of dimensions, you will find the Euclidean distance between every pair of points in the space. You’ll also find the ordinal ranking of the pair (with 1 indicating the pair that are closest together in the space), and a classification as “close”, “mid”, or “far” based on a ternary split of the rank orderings. Summary statistics are displayed in a small matrix to the right of the prototypicality summary statistics, and at the top of the sheet, these summary values are plotted. Raw data matrices: Here, you can find all the raw data matrices that were collected for real participants, and Monte Carlo simulations. The real data are ordered according to stimulus category (e.g., “Stim1”, “Stim2”).